Number 3 Selkirk Road Tooting became Harrington’s Pie & Mash shop in the spring of 1908 when it was bought by Bertie John Harrington and his wife Clara. 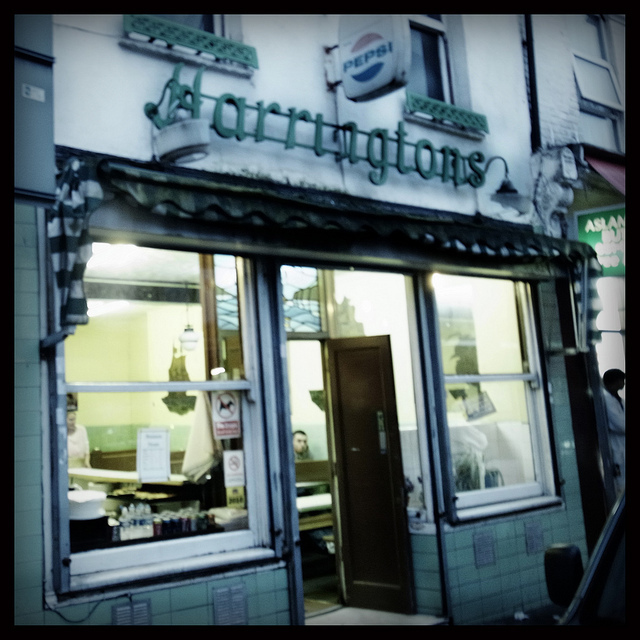 With two small children in tow, Bertrum and George, 26 year old Bertie Harrington moved from Limehouse and set-up shop down south, serving pie and mash to the SW17 community for the next 31 years until his death at 57 in 1939. At the time of his arrival in Tooting, industrial air pollution tended to be worse in the east and south of the city due to the prevailing westerly wind, this naturally contributed to the reason why these parts of the city were settled by the working classes, while the west was home to the affluent minority. The working class favoured foodstuffs that were cheap, in plentiful supply, and easy to prepare. The good old fashioned savoury pie has long been a traditional food, and its small hand-sized form also made it a transportable meal, protected from dirt by its cold pastry crust. European eels baked in a pastry crust became a common worker’s meal since eels were one of the few forms of fish that could survive in the heavily polluted river Thames and London’s other rivers at that time. Supply was plentiful through to the late 1800s, particularly from the Dutch fishing boats landing catches at Billingsgate fish market. Adding cheap mashed potatoes made it a plate-based sit-down meal, and a sauce made of the water used to cook the eels, coloured and flavoured by parsley – the liquor – made the whole dish something very special. After Bertie’s death Clara Harrington continued to run the shop through the Second World War and well in to the late fifties when it was then taken over by her third child Viktor – born at the shop in 1910 – and his wife Doris. After Viktor’s death in ’68 Doris, despite some protest, hung on the shop until the introduction of VAT in 1979 when she then passed the shop on to her nephew Viktor (another Viktor!) – Son of Marjorie, Clara and Bertie’s last child. Viktor and his wife Gloria ran shop well into the 21st Century, until Viktor’s death in 2007, followed by the untimely passing of the much loved Gloria who passed away in 2012. Beverley Mason the daughter of Viktor and Gloria continues to run the shop today with the help of her daughter Jasmine. Bev has spoken to me about the days of live eels kept on racks in the basement, and how as a child, she would sometimes bring one home and play with it until she’d get bored and throw it into the stream at the bottom of the garden. The days when the upstairs room (the actors dressing room) still complete with marble counters used to be packed on a Saturday and the dumb waiter was an essential part of service. She has spoken about the generations of families she has seen come and go, including her own, and her personal up downs that the Harrington’s walls have borne witness to over the years. There is too much to write here. 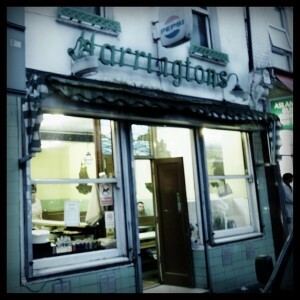 Harrington’s continues to serve pie and mash to the Tooting population some 106 years on and still does a roaring trade today. The queues down road on Saturday always turn a few heads. And now the oldest business in SW17, a Tooting institution, became London’s newest and most unusual theatre venue, I wonder what Bertie and Clara would have made of that.